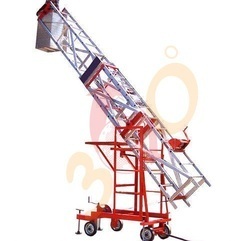 We are a leading Manufacturer & Exporter of Aluminium Ladders such as Tiltable Mobile Tower Extension Ladder, Tiltable Tower Ladder, Aluminium Tiltable Tower Ladder, Trolley Step Ladder, Oil Tanker Aluminum Mobile Platform Ladder, Wall Support Ladder and many more items from India. Grade t6 temper. hindalco make step made up of of 26mm x 3 mm thickness non slip, extra grip checked sheet steps high quality polymer wheels mounted on a ms trolley along with brake. RUNGS 1" Dia, Non-Slip Corrugated Tubing at 10",12"
It is manufactured from high tensile tested aluminium alloy which is rust proof. It is light-weight strong durable and has long lasting construction. Ideally suitable for every modern home office stores workshop factory mill and showroom. Provided with rubber shoes and caps or hooks. 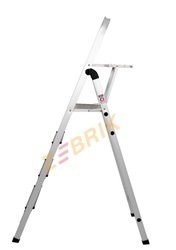 Foldable Aluminium Ladder provides adequate protection to a person working in adverse working conditions. Main extrusion made up of Aluminium Ladder alloy ‘c’ section 66 x 32 x 3. 18mm thickness of HE 30 grade T6 temper. Extra grip round corrugated flutted pipe steps. A Tower ladder possessing the desired feature of big towers. Made from high tensile Aluminium strong, sturdy and durable. 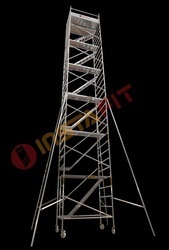 These Tower ladders are of high quality and are known for its efficient working. 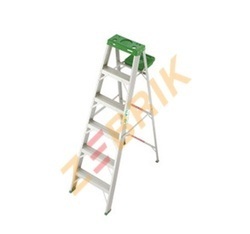 As an acclaimed entity, we are highly engaged in offering an array of Aluminum Wide Step Hook Ladder. 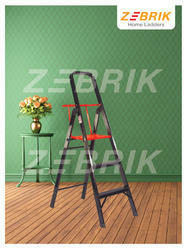 Customers can avail these ladders in multiple sizes to suit their diverse needs. The provided product occupies less space and is acclaimed for its high strength and quality construction. We have gained expertise in offering a quality assured assortment of Double Sided Aluminium Ladders. 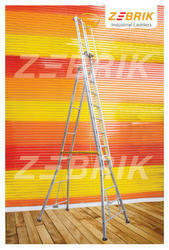 The Double Sided Aluminium Ladders we offer is widely demanded for its durability and reliability. Our products are tested for their quality before being introduced in the market. 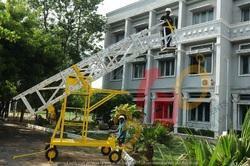 We are a manufacturer of Rope Ladder Hire and providing on Hire in Chennai. Aluminum rope ladder, Aluminum rungs rope ladder are widely used in construction and industries because of their light weight and durability. They are more flam resistant than other material like wood. 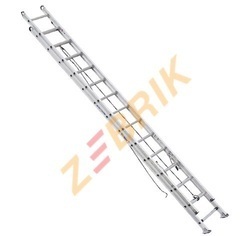 Due to light weight compare to wooden rungs ladder it is very easy to carry and install aluminum rung ladder. 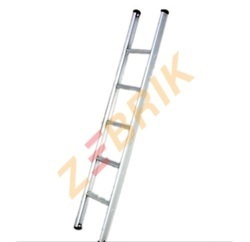 Aluminum rungs ladder, webbing strap aluminum ladder are also economical therefore preferred in the market. We are a leading manufacturer of different types of aluminum rung ladders made from polypropylene rope, polyamide nylon rope and polyester webbing straps. Our aluminum rung rope ladders are made of ISI marked polypropylene rope or polyamide nylon rope with aluminum rungs. These are available in 10 mm & 12 mm dia rope with standard aluminum rungs size 18 inches wide & 25 mm dia. Aluminum rungs are made of best quality corrugated aluminum pipes. Rungs made of corrugated aluminum pipes of 25 mm dia available in one hole and three holes type. On upper extremity each rope have spliced loop with metal thimble and spring hooks. Also available with Scaffolding hooks. Both ends of rungs are fitted with rubber bushes. Ideal for working on heights at construction sites and industries. Main Extrusion made up of Aluminium alloy ‘C’ Section 66 x 32 x3.18mm thickness of HE 30 grade T6 temper. Steps made up of 26mm x 3mm thickness Non slip, extra grip round corrugated flutted pipe steps. 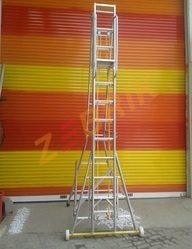 Aluminium alloy heavy duty box type Tiltable Tower Extension Ladder, mounted on 4 nos. special type solid rubber tyre 12” x 3 ½ “ size wheeler . MS Channel trolley, provided with top working platform of size: 18” x 22”, Tools tray of size : 18” x 10” – 2 nos, Gear winch 1no. for extension & lowering purpose and another 1no. for tilting purpose, 4nos. screw type ground lock and tow bar handle. Aluminium reinforcement for extra safety & stability. The rungs are fitted in the loop formed by stitching of duplex polyester strap with rivet. In other design of ladder teflon made solid bush is passed from the loops of webbing and fitted with threads in the aluminum rungs. Advantage of this ladder is that any of rungs can be replaced whenever required. Ideal for working in storage tanks, gas chambers and at heights. 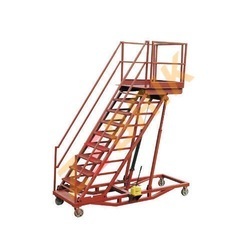 We are a leading Manufacturer & Exporter of Aluminium Safety Ladders such as Emergency Escape Rope Ladders, Safety Roof Top Ladder, Pilot Ladder, Fiberglass Ladder/ FRP Self Support Ladder, Aluminum Tiltable Tower Movable Ladder, Embarkation Marine Ladder and many more items from India. 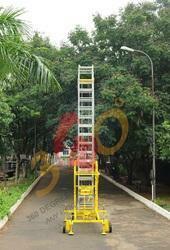 We are a manufacturer of Wall Support Extension Ladder Hire and providing on Hire in Chennai. We put forth to our clients Self Supporting Extension Ladder fabricated using premium grade, high tensile aluminum alloy. 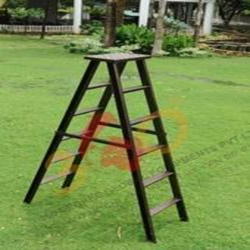 Being a heavy duty ladder it is highly durable, strong and long lasting in nature and hence, is widely used for small industrial purposes such as for maintenance of streetlights and for commercial use. It is provided with additional function of extension and can be handled with relative ease. 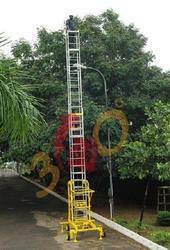 Our range of Self Supporting Extension Ladder can be availed in several variants in terms of quality, sizes and steps. 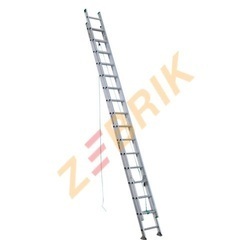 This ladder is available in sizes varying from a minimum 5 ft. (1.52 meters) closed height X 8 ft. (2.44 meters) extendable height to maximum 20 ft. (6.1 meters) closed height X 35 ft. (10.67 meters) extendable height in single extension only. Additionally, customers are also eased with the availability of our other Ladders in varied specifications mentioned below. We have been counted as major firm offering high performing Aluminium Ladders. 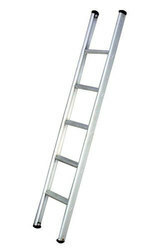 We are providing a robust range of ladders that is cost effective and gaining wide popularity for its durable life. 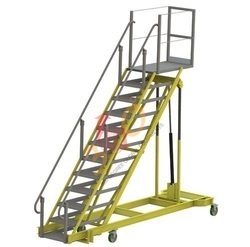 Designed especially to offer higher stability the offered range of ladders is suitable for installation and upkeep works in domestic and industrial sectors. 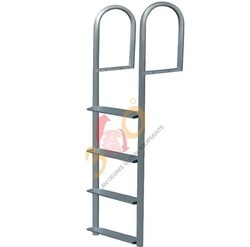 Further, we procure finest grade aluminum alloy to fabricate the light weight ladders that can be ordered from us at the best price in the segment. 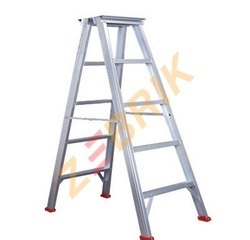 Our firm specializes in offering an excellent range of Aluminum Ladder, which is used in various construction applications. To maintain industry defined quality standards, the entire range is manufactured using quality proven raw-material and cutting-edge technology. 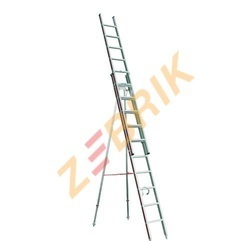 Also, this ladder is examined properly by our quality experts upon distinct parameters of quality. In line with international set standard we provide this ladder in various sizes as per the ever-evolving needs of our clients. 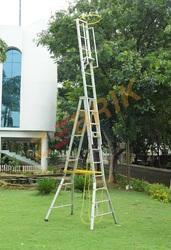 By utilizing latest technologies and modern equipment, we are involved in dealing a wide range of Folding Ladders. 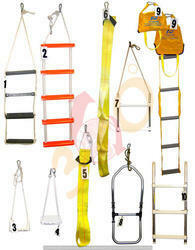 These ladders are well designed and widely used in construction sites. High tensile strength, long terms service and reliable service are some of the main features of these Multi Purpose Folding Ladders. Nonslip, extra grip round corrugated fluted pipe steps. We are well known enterprise instrumental in developing best in class Aluminium Double Extension Ladders. 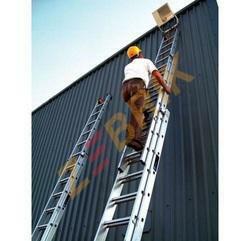 The ladders are widely demanded for fitting signs, roofing and insulation works on walls and facades. Featuring easy to erect design the offered ladders come with assurance of high stability and superior protection. We are procuring premium grade raw materials to fabricate these ladders in industry compliant standards. 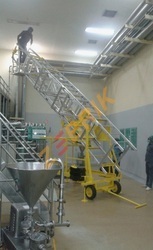 Further, the high performing ladders can be ordered from us in varied sizes at a competitive price. Main Extrusion made up of Aluminium alloy ‘C’ Section 66 x 32 x3.18mm thickness of HE 30 grade T6 temper. Steps made up of 26mm x 3mm thickness Non slip, extra grip round corrugated flutted pipe steps. 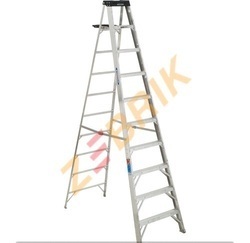 Aluminium alloy heavy duty box type Tiltable Tower Extension Ladder, mounted on 4 nos. special type solid rubber tyre 12” x 3 ½ “ size wheeler . MS Channel trolley, provided with top working platform of size: 18” x 22”, Tools tray of size : 18” x 10” – 2 nos, Gear winch 1no. for extension & lowering purpose and another 1no. for tilting purpose, 4nos. screw type ground lock and tow bar handle. Aluminium reinforcement for extra safety & stability. Apart from sale and rental we are give Aluminum Ladder Repairing Services in chennai. We have been doing this in Tamilnadu, Kerala, Andhrapradesh, Karnataka. The average ladder can be repaired for about half the cost of a replacement product. 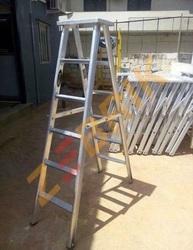 We offer professional repair & service for most of the aluminium ladders. We can also straighten most aluminum extension ladders that become bent. Hidalco make, step made up of of 26mm x 3 mm thickness non slip extra grip round corrugated steps, easy sliding of rope winch stoppers and pulley arrangements. High quality rubber wheels for movement. Hindalco make, step made up of of 26mm x 3 mm thickness non slip extra grip round corrugated steps, easy sliding of rope winch stoppers and pulley arrangements. 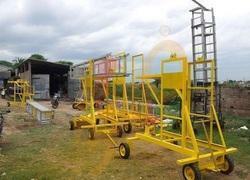 Our clients can avail from us a quality assured assortment of Aluminium Scaffolding Climbing Ladders. 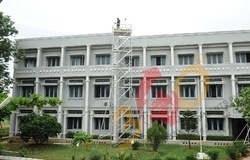 The Aluminium Scaffolding Climbing Ladders we offer is widely demanded for its durability. Offered products are made by using high grade material. 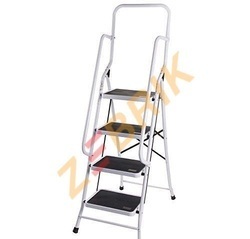 Keeping in mind the requirements of our clients, we are offering Double Platform Self Supporting Folding Ladder. Available with us in different sizes ranging from 5 ft To 20 ft; the given product is widely demanded in the market due to its sturdy design, durability, and high load bearing strength. Size Available 4ft to 24 ft. Step made up of of 26mm x 3mm thickness non slip,extra grip round corrugated flutted pipe steps. Easy sliding of rope,stoppers and pulley arragements high quality leg grip rubber shoes for bottom legs. Non slip extra grip standing platform top tool tray safety rings,etc,. 18" x 4 1/2", 18" x 6", 24" x 7"
18" x 18",24" x 24"
Made available by us is a commendable range of Overhead Water Tank Or Sump Ladder. 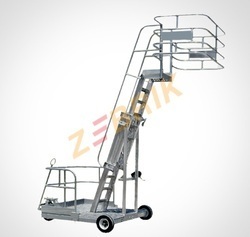 Widely used at different places, the offered Overhead Water Tank Or Sump Ladder is available in different designs and other related specifications, which are necessary for their use. In addition to this, our provided Overhead Water Tank Or Sump Ladder is rigorously tested by the team of quality controllers to ensure its reliable performance. Our prestigious clients can avail this product from us at market leading prices.